In October, Bauhaus will take a two year hiatus from its iconic Melrose and Pine corner space, but Capitol Hill’s gateway cafe is keeping its neighborhood presence by moving to a new nearby location. “Bauhaus will not be leaving Capitol Hill,” owner Joel Radin tells CHS. The exact location is still being kept under wraps as Radin works out the lease, but he said the new Bauhaus would be “very close” to its current E Pine location. Radin said he expects the new Capitol Hill Bauhaus to be open by December. With a new Bauhaus opening in Ballard this September, it appeared that Capitol Hill would have to (temporarily) say goodbye as the much adored coffee shop moved out for preservation and redevelopment of its E Pine building. 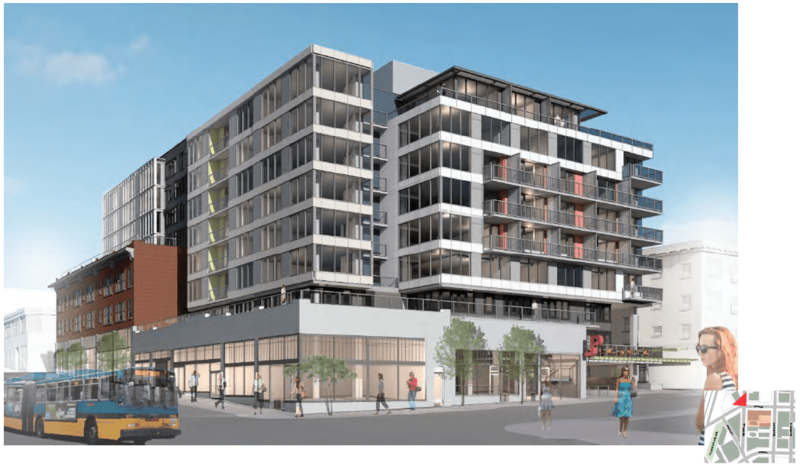 In news that sent shock waves through the neighborhood, CHS reported last year that Madison Development Group was purchasing the half-block of E Pine for the new mixed-use project Melrose & Pine. Radin said as soon as he found out Bauhaus would have to move out, he began his search for a new location on the Hill. Soon after, Radin reached an agreement with Madison that Bauhaus would be given first dibs on a lease in the refurbished Melrose & Pine space once it was ready, likely sometime in 2015. Bauhaus was originally slated to be out of its current location by September, but Radin said the developers told him this week the cafe can stay until October 5 — making it 20 years to the day since Bauhaus opened its doors in 1993. Radin said he doesn’t have any plans for an anniversary party. CHS suspects many cups of nostalgic espresso will be sipped. As for the Bauhaus baristas, Radin said they will all have the opportunity to work in Ballard or Capitol Hill. “Whoever wants to stay can stay… we have a little family,” he said. This entry was posted in Food & Drink, News, etc. and tagged coffee, development by Bryan Cohen. Bookmark the permalink. This is great news! But the current Bauhaus is a beautifully funky space, and it will be difficult to re-create it in a new location….especially in the redeveloped building, which looks very sleek and modern, not at all in line with what the Bauhaus is like now. Still, I wish Mr. Radin the best of luck, and also thanks for his commitment to Capitol Hill! I agree but hopefully a lot of the mill and casework can be removed and installed in the new spot to replicate as much as possible. I’m all for better restrooms in the new space – I won’t miss the current ones. I’m just thankful they are moving rather than closing. Wishing the team a smooth transition. I overheard from one of the baristas a few months ago that they were looking into moving just across the street to the new Bellevue & Pine development next to Broadcast Coffee. I don’t know if that’s still the plan, I don’t think the building will be completed by October. There is a nice space in the new building on Pine and Minor that was just completed. Bauhaus has been there 20 years?! My god, I’m old. What about Wall of Sound? They’ve already had to move from their original Belltown location, and now this. Great news! The Bauhaus baristas are the best! Bauhaus is my mistress to Victrola ( or v.v.?) If they move onto the same street, I’ll be found out and forced to choose! The empty space in the Terravita at Pine and Summit seems like a good fit. There’s that little patio area where they could put out their chairs for people to lounge about on. if they can manage to make that space feel warm/inviting, that’d be great.. though directly across the street from black coffee co-op hmm. I’m hoping they move to the corner space at Pine+Minor as D Murray mentioned, if it’s big enough. Outdoor seating on the wide sidewalk (.. err.. i guess that’s a park technically) between the building and the dog park, nicely tucked away from motorists and the pedestrian rush of Pine. It’d be a big win for Pine+Minor to get a tenant that isn’t some big ugly chain store. Has there been any talk or designs of what the interior of the renovated Bauhaus will look like? Will the Mezzanine make a return? P.S. When you tear out the bathrooms, sell the blue bricks as keepsakes. I tell people all the time that I used to sit upstairs drinking tea and smoking cigarettes there when I was a young man, many good memories of the funky space. Glad they are going to stay local. As long as they keep the same hours, this is the best news of the summer!